Twenty years later, Randy Hetrick has made it effortless to find TRX straps in more than 25,000 gyms around the world. In the summer of 1997, Randy Hetrick was a Navy SEAL troop commander who wanted to train his climbing muscles so as to defeat pirates. He was stationed in a little warehouse in Malaysia, preparing for a mission that, if approved, would require him to climb the side of a freight ship with 80lbs of gear on his back. Tone your muscles by using these TRX exercises. He had no gym equipment at his disposal—or so he believed. Then he found a jujitsu belt stashed away in one of his bags. He suddenly thought: I wonder if I can tie a knot in the end of this belt, throw it over a door, close the door, lean back, and do a one-armed row, to simulate a climbing motion? He could. Soon, he was cranking out rows, biceps curls, and—after making a few alterations with some old parachute material—back flyes. Within months, a buddy of Hetrick’s—a parachute rigger—was reproducing Hetrick’s creation for other soldiers in exchange for cases of beer. “It just kind of proliferated as this quintessential invention of necessity,” says Hetrick, who would enroll in Stanford’s business school and develop his device, which he named the TRX (Total-Body Resistance Exercise) suspension trainer. 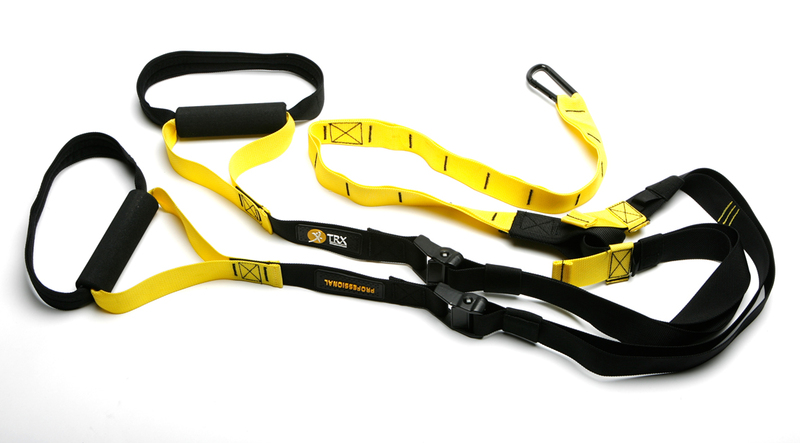 Twenty years later, you can find TRX straps in more than 25,000 gyms around the world. They’re used by personal trainers, pro athletes, and the general public to improve total-body strength, stability, and cardiovascular health. Based in San Francisco, TRX now has 110 employees, 300 course instructors, a fitness app, a TRX Academy, and annual revenues that top $50 million. When you think of successful fitness entrepreneurs, Hetrick is at the top of the list. For a bigger bench, it pays to work your stabilizing muscles TRX-style. Want to start your own fitness empire? Here’s what you can expect, according to Hetrick (@randyhetrick). “My schedule has evolved over time,” says Hetrick. “I used to be involved in every single detail of the business on every level. Early on, that’s what entrepreneurial life is about. But if you’re successful, you have to quickly pivot to building a great team. “These days, I travel a lot. But when I’m in town, I try to limit myself to a couple of meetings a day. The rest of the time I go out in the main area of our big loft, where most of the team works, and have one-on-ones. “First, you gotta know training,” says Hetrick. “And you gotta have a passion for it, because it ain’t the ‘get-rich-quick’ path that all the knockoff guys seem to think it is. “Secondly, you gotta have some basic business skills or you’re gonna make too many mistakes. Take the time to understand the general principles of PnL [profit and loss], a balance sheet, and inflows versus outflows. That’s pretty important. If you don’t have that, then partner with a business guy or gal to complement your knowledge of training. This suspension-training routine offers size with less stress on your body. A bachelor’s degree in business (with a minor in exercise science), or even an MBA. Short of that, read books like From Concept to Market and This Business Has Legs (the story of the ThighMaster). Training knowledge, business proficiency, people skills, determination, self-belief, salesmanship, dogged persistence, and foolish optimism. Build muscle via an unlikely source—the TRX suspension trainer—using this full-body workout.